Take a short stroll around the corner from our shop and you will find the Infinity Foods Kitchen on Gardner Street. Co-operative Run by an inspired team of vegan chefs and cooks. A wide range of natural and organic, freshly cooked, seasonally inspired food. Available to eat in or take away. If you have a special occasion coming up we have a variety of sweet treats available to order, all of which are vegan and organic. The Kitchen is light and airy with ample seating on two levels and customers can enjoy alfresco dining in the warmer weather. 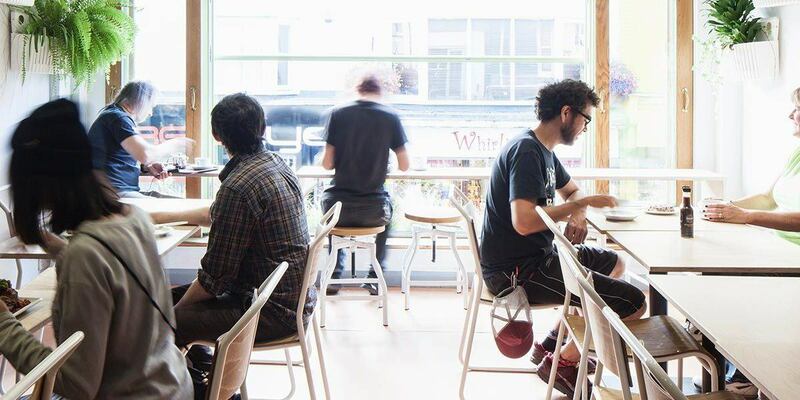 Our upstairs seating area hosts exhibitions from local artists and overlooks the bustling Gardner Street offering one of the best opportunities for people-watching in all of Brighton’s famous North Laine. There is wheelchair access to our ground floor which has a seating area, however our toilets are only accessible by a flight of stairs. We have high-chairs and baby changing facilities. Please phone us if you have any queries. Keep up to date with all the happenings at the Infinity Foods Kitchen, via our Instagram and Facebook.